Whether you are a small business owner of a restaurant or a real estate agent, business flyer printing is an integral part of your marketing strategy. Business flyers are an easy way to spread the word about new products and a cost-effective way to communicate with your audience. 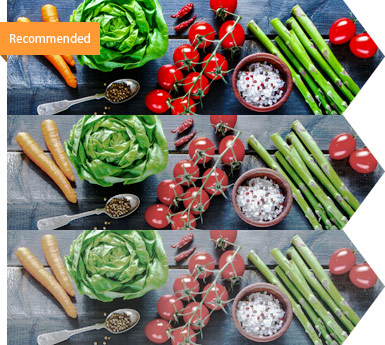 Six material options that will make an impact on potential and loyal customers. The 70 lb. is our most lightweight paper stock and has a texture and thickness similar to the inside pages of notebooks. Our 80 lb. paper has a thickness similar to magazine paper. We recommend applying gloss coating on both sides if you’re looking for that extra shine. The 100 lb. paper is our thickest paper stock available and is similar to the pages of a coffee table book or children’s book. The 10 pt. cardstock has a thickness similar to greeting cards, but thin enough to fold. It makes your flyer easy to keep but less likely to crease. The 14 pt. cardstock is normally seen on business cards and postcards. They’re bendable but unlikely to break and tear like paper. The 16 pt. cardstock is our thickest and most durable material available. It is tear and wear resistant. We recommend this for brands that want to make a memorable first impression. Still unsure about your choice of paper or cardstock? Read more in this article that differentiates paper from cardstock. Whether you’re creating real estate flyers or custom flyers, every design is sure to stand out with our full color coating options. Colors are sure to pop and stand out with the high gloss UV’s extra shine. It’s also resistant to abrasion and writing. The standard choice for flyers thanks to the sheen it gives on both sides. Companies that are after a sophisticated finish can apply the subdued, elegant touch of matte. Get started on that business flyer design by using our online design tool or uploading your own. Select our “Ready Today” option for rush orders and start with a free file proof to ensure the order is error free before printing. Below is an extensive collection of flyer templates in Adobe Photoshop and Illustrator formats for you to download and create totally rad sports bar flyers, spring break flyers, and other popular themes. 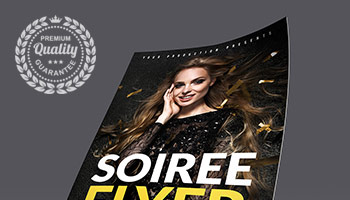 Ranging in styles from elegant spiritual flyers to energetic game day flyers, these free flyer templates are just the ticket for your event promotion. Get straight to the point. The discount or message you’re offering should be immediately seen on your business flyers. Make information easy to read. Don’t be afraid to use large font sizes. There should be a header to guide the reader. Can I get my business flyer printed today or on the next business day? You can choose to have the flyers printed today, by the next business day, or in three business days, depending on your timeline. Our printing turnaround indicates the number of days allotted to print your order. Note that this does not include weekends and holidays. Shipping transit time is not included in the printing turnaround. To find out when you can receive your order, select “Get Delivery Estimate” at the bottom of the online calculator. Which among the paper types are the sturdiest to use? Our thickest material is the 16 pt. cardstock, while the 10 pt. and 14 pt. cardstock are slightly thinner but still durable. The paper stock options are more lightweight and suitable for handing out in large quantities. Which among the coating options are writable? We suggest selecting the uncoated option if you need to write information on your flyer. How can I ensure my order is protected during shipping? Although we take care in packaging and shipping every order, we also offer shrink wrapping as additional protection for your business flyers.